If someone in Warrenville has a problem, others will help. Find volunteer opportunities on this page. If you are part of an organization looking for volunteers, send an email to sue@warrenville.info to enlist some help. Please specify volunteer details (time and place, jobs, number of volunteers needed) as well how to go about volunteering. If you take a look at your ballot now, you still have time before election day, Nov. 6, 2018, to figure out how to vote. Take a look at the choices for local offices, they might impact your life more than those on the national stage. Finding the ballot is the easy part. Now you have the harder job of deciding how to cast it. If you're still looking for information on that, I just learned of a website ballotready.org. This site has a tab for each candidate on your ballot, along with links to learn their stances on many issues and a newsfeed of artices printed about them. This is not an official ballot, and does not contain all the local items. Shall DuPage County oppose the General Assembly instituting a property tax increase equivalent to 1% of your home’s value to help retire state debt? Shall DuPage County oppose the creation of a statewide Vehicle Mileage Tax (VMT) which would tax DuPage County citizens based upon the number of miles driven annually? Shall DuPage County continue to dissolve and consolidate units of local government to reduce costs, increase efficiencies, and increase accountability? 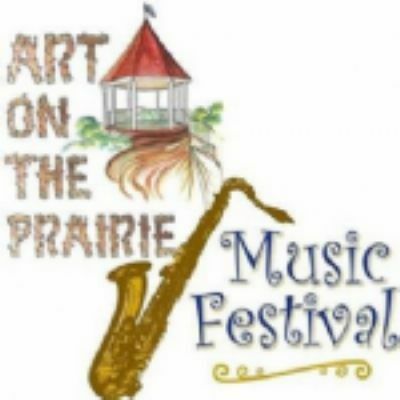 Art on the Prairie, Warrenville's fall art and music festival, is coming up on the weekend of Septermber 15 and 16, 2018. The park district is looking for volunteers. Your help will make this event run smoohtly. To volunteer, call the Park District 630-393-7279 Ext. 307 or email ruthb@warrenvilleparks.org. Enjoy live music, children's art station, taste Two Brothers beer & products and shop for art as you stroll through Warrenville City Hall Complex. This juried art fair features photography, wood work, jewelry, ink prints and much more from Midwest artists. Sponsored in part by the City of Warrenville Hotel Motel Tax Fund. Funded partially or wholly by the City of Warrenville. Thank you to our sponsors NorthStar Credit Union, Daniel and Associates Real Estate, Warrenville Public Library District, East China Inn, Two Brothers Brewing Co., Art Works IL Arts Council, Edward Jones, Daily Herald Media Group, Chiro One, Ed Hoy's International, Ball Hort. Will You Ask for a Democratic or Republican Ballot? The upcoming election is a primary, so your ballot will not have all the candidates that you see in the commercials. You must choose which ballot you want to vote. Looking up the ballots, there was one surprising issue on both ballots. This issue is, "Should the DuPage County Elections Commission be dissolved, and it's functions be consolidated with the office of the Dupage County Clerk." This question is on the Republican, Democratic, and the only item on the Non Partisan Ballot. It is probably on all ballots in DuPage County. D14 Candidate Forum: Sunday March 11 from 6-8 pm at Warrenville City Hall. If you are in DuPage County, follow these steps to enter your address and you'll have the ballots. For this election there are Republican, Democrat, and Non-Partisan Ballots. Click to "View Ballot" links to get each ballot. Art on the Prairie, Warrenville's fall art and music festival, is coming up on the weekend of Septermber 16 and 17, 2017. The park district is looking for volunteers. Your help will make this event run smoohtly. See the flyer below for the full schedule of events. To volunteer, call the Park District 630-393-7279 Ext. 307 or email ruthb@warrenvilleparks.org by Friday Sept 8. Don't Be Surprised in the Voting Booth - Check Your Ballot Now! If you take a look at your ballot now, you still have a few days before the election day on April 4, 2017, to figure out how to cast your ballot. Local representatives can have a direct impact your life, so take the opportunity to vote. I can’t attach your ballot, because even within Warrenville, there are multiple districts at every level of government – each with different boundaries. Hence, just for Warrenville voters, there are ballot variations, so you need to look it up. (Note: someone came knocking on my door with info, including a ballot with recommendations -- it was NOT the correct ballot for my address). If you live in wards 2, 3, or 4, you don't need to worry about alderman - the candidates are unopposed. Library Board, Park District Board, and DuPage county offices uncontested. Warrenville.info does not endorse any candidates, but here are some resources that you can use to make your own decision. The candidates night (for alderman and mayor) held on March 21 at City Hall was recorded. Watch the candidates forum if you missed the meeting. Should Warrenville Annex to Naperville? "Since the news broke that petitions were being circulated to annex Warrenville (and Lisle AND Woodridge) into the city of Naperville, I have been so very proud of the reactions of our mayor, and the spirit of our citizens as seen in personal conversations as well as on social media. The common statement has been, we love Warrenville, BECAUSE it is not Naperville. 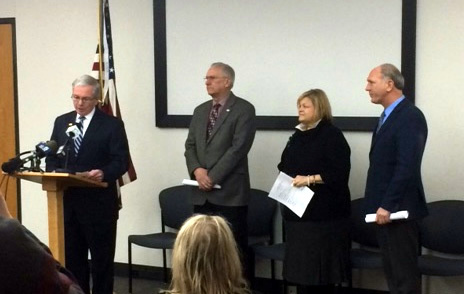 I have been following this situation in a number of ways and attended the press conference with Mayor Brummel and the mayors from Woodridge, Lisle and Naperville. It was Mayor Brummel who called the press conference and has taken the lead in connecting the communities for a united response. It was Mayor Brummel and the city of Warrenville who prepared a written statement for the press which was available for attendees to read and follow during the event. And it was Mayor Brummel who started off the press conference with a well crafted speech that this effort is indeed not being initiated by our residents and would not benefit our community. One point which some of the news outlets are citing incorrectly is that some residents of Warrenville are trying to make this happen. There is no evidence of this. The petitions are being circulated by paid individuals who do not live in Warrenville, (some live in Chicago) by an attorney from Chicago, Frank Avila. It was stated that many of the 81 signatures from Warrenville did not appear to be valid. Mayor Brummel and the other officials are stumped as to why this is being done, but do talk about the time and man/woman hours needed to refute this effort. Mayor Brummel and the mayors from Lisle and Woodridge filed objections to the petition today in DuPage County Circuit Court. Want to see the ballot? 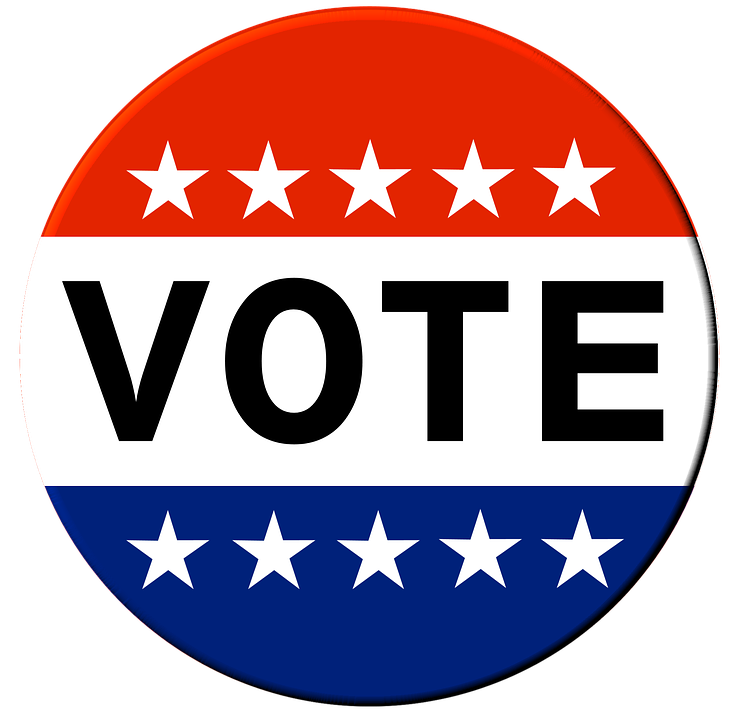 Get directions to find your DuPage County Ballot. My ballot looked like this. If you take a look at your ballot now, you still have time before election day, Nov. 8, 2016, to figure out how to vote on the more obscure offices and issues. These local representatives might impact your life more than those on the national stage. I can’t attach your ballot, because even within Warrenville, there are multiple districts at every level of government – each with different boundaries. Hence, just for Warrenville voters, there are ballot variations. Finding the ballot is the easy part. Now you have the harder job of deciding how to cast it. If you're still looking for information on that, I just learned of a website ballotready.org. This site has a tab for each candidate on your ballot, along with links to learn their stances on many issues and a newsfeed of artices printed about them. For my address, I also found information on the state-wide "Transportation Lockbox" ballot item, but did not find information on the local referendums (Mosquito Abatement issue for all of DuPage County, and Musselman Property development issue for Warrenville residents only). Someone passed along information they received from the Warrenville City Attorney on the impacts of the Mosquito Abatement Issue. 1) This is a non-binding (advisory) referendum question and will not change anything whether or not it passes. 2) Regardless of the referendum outcome and any future actions by the Township’s efforts to consolidate mosquito abatement services, the township cannot provide that service within the incorporated City of Warrenville boundaries. 3) The Township does not have jurisdiction for general services such as mosquito spraying within municipal boundaries. They may only serve the unincorporated areas. 4) The Township would need specific state legislation giving it such authority, or some type of intergovernmental cooperative agreement specifically with the City of Warrenville, to provide mosquito abatement within the corporate limits of the City. 5) The City Council has not changed its policy against mosquito spraying within the City and there are no plans or actions to change that direction. There is an article about this ballot item on the last page of the latest Homewtown Happenings. 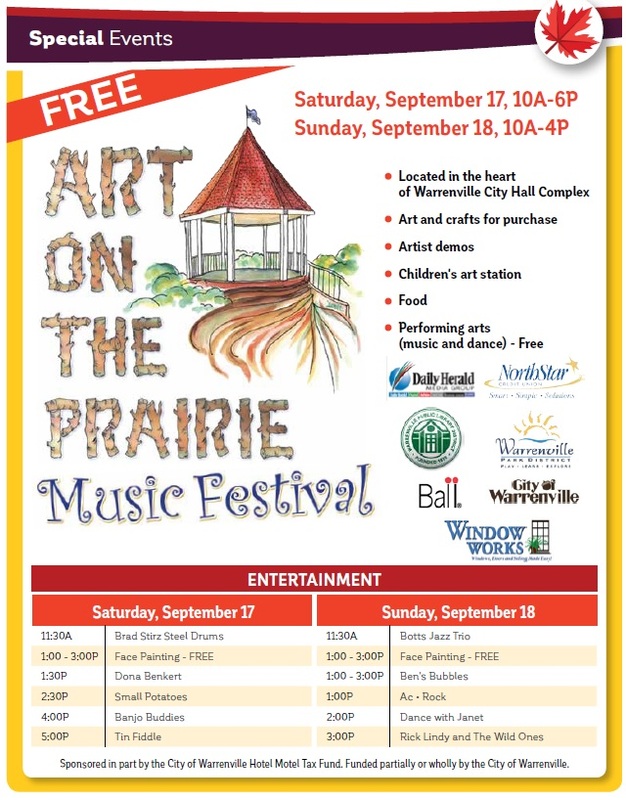 Art on the Prairie, Warrenville's fall art and music festival, is coming up on the weekend of Septermber 17 and 18, 2016. The park district is looking for volunteers. Your help will make this event run smoohtly. To volunteer, call the Park District 630-393-7279 Ext. 307 or email ruthb@warrenvilleparks.org by Friday Sept 9.